Not only are portfolio websites a great way of making the best possible first impression, but they also help you put your work “out there”, build your brand, and attract new clients while keeping your best work well-organized and displayed for everybody to see. However, if you want to get the most out of your portfolio site, first you need to think about your portfolio design. You need to look at your portfolio through your potential clients’ eyes and make it as appealing as possible. We know that our Amelia users are designers who care about their portfolios, so we are going to take a look at the best portfolio websites and help you choose the best design to inspire you for your own creative portfolio. If you want to build your own graphic design website, you are free to make it as creative as you feel necessary without going over the top. After all, graphic designer portfolio websites are supposed to be unique and creative to help you show off your style right from the start. You are very welcome to experiment, just don’t forget to take a step back and look at the website from the visitor’s perspective. If the site turns out to be too confusing, take it down a notch and make it easier to look at, understand, and navigate. If you find yourself lost in a sea of your own ideas, it might be a smart thing to do to check out some other graphic design portfolio websites out there to see some good portfolio examples created by your peers. Not only could it give you some fresh portfolio ideas, but you could also learn from their mistakes if you notice any. Lotta Nieminen Studio is a graphic design, art direction and illustration studio creating holistic visual solutions for clients across disciplines. Another great example of graphic designer portfolio websites comes from Matt Pamer. Matt Pamer is an art director, designer, and illustrator with over 15 years of experience. She is an illustrator based in Atlanta, Georgia. Right now she is doing fun things at MailChimp and taking on the occasional side project. Danny Jones is a 3D Designer in SF, specializing in 3D interaction + visual design. Kimi Lewis Studio is a full-service branding outfit in Los Angeles that creates powerful storytelling through distinct visual language. They have yet another beautiful example of graphic designer portfolio websites. Amber Xu is a motion graphics designer, illustrator based in NYC. He is a freelance designer and web developer, who works with a variety of clients and on many diverse projects. Rafael Kfouri is a graphic designer currently working with people from Crane. A beautiful example of graphic designer portfolio websites is the one of Heather Shaw.As an independent designer, Heather Shaw can take on projects of all kinds, which allows her to tap into all of the experience I’ve accrued through the years. Stefanie Brückler is an Austrian Designer, living and working in New York City. Formerly at High Tide, she is now a Senior Designer at NR2154. Peter Komierowski is a visual designer working in Vancouver, British Columbia. He specializes in illustration, branding & identity design, and interface design. He believes that design is a process and that through research and exploration, the right solution will present itself. Tobias van Schneider is a German multi-disciplinary maker of useful, curious and beautiful things. Based out of Toronto, Canada, Grant Burke an experienced graphic designer who uses strategy and objective thinking to ensure that your project goals are not only met, but exceeded. If you are looking for minimalistic graphic designer portfolio websites, this one is a gem. Alessandro Scarpellini is a brand designer and art director from Italy. Nicolas Paries is a French art director & interactive designer working in the industry since 2008. She is a multidisciplinary designer & illustrator, as well as the founding partner at Self Aware. She is focused on bringing brands to life in print & online and loves telling stories through colorful illustration and immersive interactive experiences. Currently residing in Philly, Jennifer is saving up for a cute lil’ Yorkie. This website combines resume and video game. It wins many design awards such as The FWA, Awwwards, CSS Design Awards, and CSS Winner. Steve Wolf Designs is an Austin-based graphic design studio. Their goal is to create a meaningful and timeless design for their clients and their audience. They believe that great work comes from building great relationships. They work one on one with their clients and collaborate with them every step of the way. He is a multidisciplinary product, web & brand designer with over 10 years experience working with small businesses, for award-winning agencies and internally for high-profile national brands. Nathan Riley is a designer chap residing in the beautiful city of Bristol. He’s been designing for about 10 years, working on all sorts of projects; from interactive websites through to branding and packaging design. His website stands out amongother graphic designer portfolio websites thanks to its lux feeling. A Product Designer with a passion for translating complex problems into engaging impactful experiences. Currently a Product Design Intern at Universe. Previously designed at Work & Co and Hypercare. Mike is a UK based designer, specializing in Branding, Graphic/Web Design, Illustration & Photography. He has a worldwide client roster and his work is often featured in design related publications. Mike is also a regular speaker at design/tech conferences. Founded in 2006, Buffalo is a small web design & development agency based in Brighton, UK. Over the last few years, we’ve made a reputation for building websites that look great and are easy-to-use. Creative Mints is a boutique human-centered design agency from Prague specializing in branding, UI, and illustration. In the world of cocktails, you’ve got to have the perfect mix. Their team is like a great Negroni, with just the right balance of hard work, fresh perspective, and seasoned industry knowledge to create products that entice your senses. Their success is not only due to the quality of their work; it’s down to attitude, their approach and the way they treat their clients. Fuzzco is a point-of-view. Curiosity, playfulness and a can-do attitude combined with a dedication to making things better. They make things they want to use. An award-winning graphic designer and art director from Austria. How to design a portfolio? If you want your web design portfolio to stand out from the competition, you need to make it a memorable one. Getting an employer’s attention can be quite a tough task in today’s competitive market so you have to constantly work on getting better than the competitors. When it comes to building a web designer portfolio, you have to understand that portfolio websites themselves are the perfect opportunity for you to but your best work and skills on display. Take a good look at other people’s portfolio website examples and think about how to be different and stand out from them. Don’t be afraid to change things and to challenge yourself and your creativity. A personal portfolio is definitely your best friend for attracting new clients, but you have to do it right. Digital art director born in Seoul, living in Paris, raised by the 80’s. 13 years of experience available for you. ToyFight is an award-winning creative agency specializing in design. They partner with global brands and emerging businesses to create exciting and meaningful experiences, whether digital or non-digital. Studio Schurk is a creative illustration and animation studio, founded by Miriam Knijff and Wendy van Veen. Rezo Zero is a creative studio that is specialized in brand strategy and digital creation. They will work with you to design your brand identity and make it evolve in a consistent and modern fashion on each and every connected device. Wokine is a global digital agency and a startup studio, providing innovative, modern and aesthetic solutions. This is an independent studio based in Denver, CO. They create animation and interactive experience with brands and agencies all over the world. Hannah Purmort is a Digital Designer and Art Director. Werkstatt is an interactive design studio that conceives and produces innovative and tailored digital experiences. They work in a crafting spirit; starting from the idea to the production of a well-designed piece, with one obsession: the quality of the execution. A London based designer and writer. He is also a global auto & mobility director at USTWO. Lounge Lizard brand tenders always serve up something distinct. They mix a potent combination of digital marketing strategy with a generous splash of creative juices and blend in technology-focused, customized solutions as a chaser. They are a creative studio focusing on culture, luxury, editorial & art. They help clients solve business problems by fusing creativity, innovation, strategy, and craft. Sean is a web designer/developer based in Toronto, Canada. He has a passion for web design and love to create for web and mobile devices. Patrick David is a front-end developer and web designer based in Italy. He is a Toronto based French Designer currently working at JAM3. He has worked with Audi, Google, Montblanc, Adidas. New experiences and challenges are his thing. They are a creative and strategic branding agency for digital and print. Daniele Buffa is a Digital Designer based in sunny London. Currently freelancing, previously working at Google. He also won some Awards. Unlabel began with a love for fashion, design, and authentic online experiences for fashion lovers. Originally inspired by the diverse fashion scenes of NYC and Los Angeles, Unlabel grew into a multi-disciplinary studio. They believe in introducing a sense of style in everything that they do. At Verbal+Visual, they craft considered e-commerce experiences for thoughtful brands. They work with start-ups, scale-ups and entrepreneurs, to define their brand and create experiences that last. Together is a talented team of designers, marketers, and developers working exclusively with ambitious tech companies. Mirko Zeppieri is a Photo Retoucher and Digital Designer, born and raised in Rome, currently based in Amsterdam, the Netherlands. He attended the Instituto Europeo di Design (IED) in Rome, where I earned my Bachelor’s Degree in Photography and Retouching. Mobile & web development studio that builds products that deliver results. Naum is a multi-disciplinary design and development studio based in Slovakia. They solve complex challenges with simple solutions. Sparks is a brand and design agency that simplifies well. They get to the heart of your business, uncover what makes it distinct and bring illuminating clarity. This is a Cape Town based digital design studio. They focus on delivering digital products that work beautifully. They are a design studio in Edinburgh building websites and brands for modern companies who share their values. This agency believes creativity is the key to their customers’ attention. That’s why they always try to stretch the limits of what brands think they are capable of. DiploStudio is a digital and graphic design agency. Erudito is a design studio that creates beautiful digital products, brands, and experiences for amazing companies and disruptive startups. Being a new developer on the market and getting off to a right start can be quite challenging. Maybe you aren’t quite sure what your personal style that makes you special exactly is, maybe you don’t have a lot of experience, and maybe your marketing skills are the best set of skills you have. Luckily, portfolio websites can help you with that a lot. Not only will they help you organize your work and take a closer look at it to determine what work of yours you’re the proudest off, but they will also give you a great chance to present yourself as a developer in the exact way you want to be seen by the clients. Take a look at online portfolio websites, determine which personal portfolio websites you like and which you dislike, and let them inspire you. Keep in mind that you have to stand out from the competition and let your work speak for you. 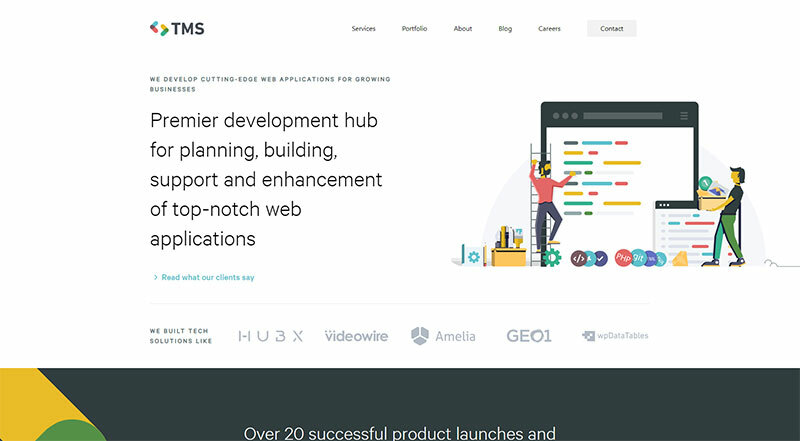 Founded in 2014, TMS was built and grown around developing their own web applications that are now used by tens of thousands of businesses and people around the world. Today they offer application development services to companies that need to scale up their development capabilities while keeping quality, improving productivity and optimizing costs. They deliver every solution with the goal of forming long-term, trusting relationships. This firm is producing high-quality responsive websites and exceptional user experience. Pierre Nel is a freelance developer & designer. He’s always been drawn to the overlap between design and development. His skills are broad: from ux to design, front-end to back-end development. He is a software developer from Dublin, Ireland. He can help you build your next product. He designs, builds, operates & sometimes rescues full-stack web applications. He is a Designer / Front End Developer living in Tempe, AZ. Daniel Fisher’s passion is creating, and he finds happiness in being a better version of himself every day. Freelance Web Designer & Developer based in Galway, Ireland. Highly experienced in designing & developing custom WordPress websites. Jack Jeznach is a front-end developer, working with WordPress and Angular JS. Matt Farley is a designer, front-end Developer & mentor. He designs and codes beautifully simple things, and he loves what he does. He is a product designer based in sunny Sydney, Australia. He enjoys turning complex problems into simple, beautiful and intuitive designs. He is a Front-End Developer for EyeCue Lab in Portland, OR. He has a serious passion for UI effects, animations and creating intuitive, dynamic user experiences. He is a Product Owner at Hostelworld, a relentless builder of side-projects and he also enjoys making animated loading icons. Josue is a seasoned software expert who has developed products for enterprise clients such as Yale University, Jimmy John’s, and Hewlett-Packard (HP), as well as many venture-backed businesses. He specializes in building applications specific to the business needs of his clients. He has done work in software development, mobile app creation, front-end/back-end web, database/server management, graphic design, and video game development. Yevgeniy (Jim) Brikman loves programming, writing, speaking, traveling, and lifting heavy things. He is the co-founder of Gruntwork, a company that provides DevOps as a Service. He is a full-stack web developer with over twelve years of experience. He has maintained, developed and launched multiple projects from scratch, carrying the development of its’ back-end and front-end codebases. His career began in Louisiana designing Flash and 3D animation, and he’s arrived as an all-around UX designer working in Texas & California. Pavel is a Czech Republic-based web designer & front‑end developer focused on crafting clean & user‑friendly experiences. A product designer with over nine years of experience. Currently shaping the digital visual experience at InVision. He is a web designer and front-end developer from Hampshire, UK. He builds bespoke websites to help his clients push their businesses further online. Based out of Halifax, NS. Specializing in custom WordPress theme development. Devin Walker is the creator of several highly rated and award-winning WordPress plugins. His work is actively being used by hundreds of thousands of websites and has been featured in Product Hunt, WP Tavern, Torque, and several other widely regarded online publications. Marek Kaleta is a web designer, skilled in UI/UX and digital design. He also has experience in prototyping, animation, and branding. Dries Van Broeck is a freelance motion designer based in Ghent, Belgium. He works with startups and top companies to design inclusive, effective, and impactful digital products. 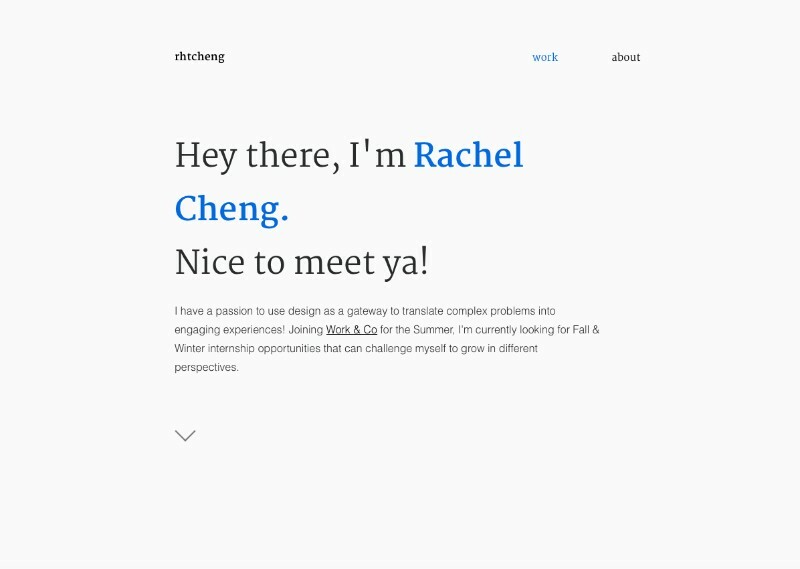 This portfolio website is a glimpse at the way he designs and prototypes in code. Design something familiar, program it to do something unexpected, make sure people feel something. They design and develop persuasive websites and mobile apps. Born and raised in Hawaii (and now living in San Francisco), he is a firm believer that you cannot succeed without aloha. Similar to the graphic design portfolio websites, with the photography portfolio websites, you want to make sure to put your best work up front. Since photography is about leaving a strong visual impact on people, you want to make a strong impression at the potential employers right away. A photography portfolio website could become a form of a delicate art and you want to make sure you present your work in the right way. For example, think about the colors you use and make sure they don’t clash with your photos and choose the best approach to make your work stand out. There are many different ways to build portfolio websites for photographers so it mostly boils down to your personal style and to the atmosphere you want your photographs to create. Allow your work to be the center of attention on the site rather than putting too much work into other design details of your artist portfolio website. He would love for his work to be seen as a celebration of human endeavor, whether concentrating on an individual’s personal sporting pursuits, or the artistry and craft involved in a highly skilled, labor-intensive industry. She does photo productions. This means she does photography as well as photo production services for national and international clients, including art direction, casting, booking of make-up/hair & styling, location scouting and retouching services. Creative director and fashion photographer based in Milan, Paolo Boccardi was born on August 19, 1976. In 2003, he moved to Milano, Italy, in order to work as art director and to study commercial photography. In 2006 he began his career as a professional fashion and editorial photographer. He is also developing his career as a creative director in Leo Burnett Milan, responsible for producing award-winning, innovative creative work. Fredrik Clement focuses on sports, people, outdoor and reportage photography. For the last ten years, he has traveled extensively, shooting stills and film for editorial and advertising clients worldwide. Brent Stirton is a South African Photographer with an extensive history in the documentary world. Brent’s work has been published by National Geographic Magazine, GEO, Le Figaro, Le Monde, Vanity Fair, Newsweek, Time, The New York Times Magazine, The UK Sunday Times Magazine and many other respected international titles. Growing up in the Colorado Rockies, his love of nature long preceded his love of photography. Being part of a family that appreciated and explored the outdoors helped him learn to appreciate and enjoy the landscape. Today he spends as much time as he can in nature hiking, backpacking, and snowboarding. Eric is a photographer and director focused on creating tangible, intentional imagery over a wide range of project mediums. Born in Staffordshire, England. Lara Jade first picked up a camera at the early age of fourteen – influenced by self-portraiture and conceptual photography. Corey Arnold is a photographer and commercial fisherman by trade. He has worked seasonally as a commercial fisherman in Alaska since 1995, including seven years of crabbing in the Bering Sea aboard the f/v Rollo. Andrew Gransden is a qualified professional photographer covering the north east of Scotland from Aberdeen to Inverness and from the sea to Strathspey and the mountains. Dave is a photographer and filmmaker living in Los Angeles. He got his start shooting album covers for 50 Cent, Chris Brown, Soulja Boy, etc. This led to shooting national ad campaigns over the past decade. Recent clients include Fiat/Chrysler, Ford, Buick, Chevy, Toyota, Shaun White, Target. Gavin Gough is a freelance, editorial photographer, documenting stories which reflect the human condition. Photographer Ryan Michael Kelly is currently based in New York City. He is literally addicted to making photos…for which there is no known cure, except to make more. Ryan Edy originates from the North East of England via Zimbabwe. He’s always had a keen interest in capturing his vision of the world around him, from constantly sketching stuff as a young child to embarking on his first forays with his Father’s camera. He has not swashbuckled with pirates, nor has he swam the English Channel. He has not even been to Antarctica. But he has travelled to many far away places, created a lot of still and moving pictures for himself and others. And he’s made it his life’s goal to be as creative as possible towards everything he endeavors. Jonathan Glynn-Smith’s photography has spearheaded advertising campaigns, books, and exhibitions for some of the worlds leading blue chip clients. His evocative and timeless images have inspired magazine editors, luxury brands and his viewers for nearly two decades. A photographer born in the Czech Republic. Since the first step on the continent in Rio de Janeiro many years ago, Latin America has become a major inspiration for his photography work. From then on, he has been working and living in various Latin American countries. Lisa Bettany is a Canadian tech entrepreneur and one of the most influential photographers on the web. She is the co-founder of the top-ranked photography iPhone app, Camera+ which has sold over 14 million copies. Her vibrant, eye-catching landscape and travel photos have been viewed millions of times in magazines, online publications & TV broadcasts. To Denis Reggie, seeing the world through a camera is as natural as breathing. His camera is an extension of his mind’s eye, and he has an uncanny ability to be in the right place at the right time to capture the defining moments at weddings. Many of his photographs epitomize the joy of the human spirit. Christian Oth Studio is a full-service photography studio committed to telling your love story through editorial-style photos of the highest caliber. They strive to foster a strong connection with their clients and gain a true understanding of their vision and goals. Headquartered in the Flatiron District of New York City, they serve both local and international weddings worldwide. Levon Biss is a British photographer born in London. Throughout his career, Levon’s work has covered a wide range of photographic genres, including portraiture, documentary, and sport. His work has been exhibited around the world his prints are housed in numerous museum and private collections. He was born in the UK and raised in the African desert by bushmen. His parents were from the UK, but he did grow up shaking Kalahari sand out of his shoes. Rich McCoy builds and leads creative teams, makes things with paint, rags, and bone, and thinks a little too much. Timothy Hogan is an award-winning still-life photographer based in Los Angeles, California. Throughout much of his adult life, he’s been travelling, seeking adventure and ways to learn from and interact with cultures which are very different from my own. Photography became a great excuse to look deeper and to make his experiences more intense. Joon Brandt is a film director and still photographer based in Oslo, Norway. She wasn’t one of those people who was given a camera at age five and fell in love with photography. She was a travel journalist, working her dream job with Lonely Planet at age 23 when the magic of Marrakech begged her to take its photo. One thing you will notice immediately about the online portfolio websites is that majority of them follows the same old pattern. It is a template with the centered hero image with a call to action plus a few columns (usually 3) below it. Yes, we admit that this design obviously works but it has been seen so many times that if you want to really create something unique, you need to choose a more creative layout. You are not going to knock anybody’s socks off with something they have seen countless times before. It is time to get creative! When you search for the best creative websites online, you are not going to see 2 websites that look almost completely the same. Instead, you will see some unique ideas that will make you think, “How did they come up with that? This is great” And that is precisely what you want your potential clients to think when they first see your portfolio page. Creating unique and different portfolio websites ALWAYS pays off if you don’t go completely over the top and make them impossible to understand. Founder of OldSkullz Skateboard, Max spent 10 years filming kids and skateboarders, traveling on the road, making reports and clips, cutting and editing videos. He has developed a unique eye to capture the beauty, the dynamic and the intensity of the moment, transforming casual stories into immersive, touching and organic productions. Established in 2007, thisislove is a Lisbon based multidisciplinary design studio focused on communication design and digital projects. They are passionate about design and code and it is their goal to build innovative products and immersive experiences. Ben has over 18 years of hands-on work experience in design. He practices user-centered design principles basing design decisions on user needs and business goals. He has worked on projects for a variety of global brands including American Airlines, BMW, AMD, Nestle, and M&S. National brands he has worked with include T-Mobile, Tourism Ireland and Condor Ferries. They’re an independent digital agency with a team of designers & creative developers who relish in crafting engaging digital experiences. At Codeq, they provide web applications that meet the needs of customers. They are able to offer a wide range of services thanks to the fact that people in Codeq create a multidisciplinary team. The MOSCOT optical roots were first planted in America by Great Great Grandfather and family patriarch, Hyman Moscot, who arrived from Eastern Europe via Ellis Island in 1899. Hyman began selling ready-made eyeglasses from a pushcart on Orchard Street on Manhattan’s famed Lower East Side. They work with partners large and small from across the globe – angel investors, VCs, start-ups and global brands. Developing collaborative projects across time zones. They are a design & technology studio. They design and build all types of objects. They build the best brands and websites, incudling portfolio websites, in the world, according to their website. Stilt was founded in Miami in 2012 as a digital agency. While they still provide traditional and digital marketing, their design and brand strategy services have evolved to challenge the traditional rift between advertising and design, digital and traditional, art and commerce, creativity and business. Canopy Films is a production house based in Boston. With a background in documentary filmmaking, they know that the story always comes first. Their story and aesthetic-driven approach produces works with a focus on characters, collaboration, and creative exploration. They’re always on the lookout for stories to tell. HA is an Interactive brand studio. They focus on strategically and creatively driven innovative digital solutions. They are a branding and packaging innovation agency, dedicated to creating brands worth remembering. Just ask Tanqueray & Tonic, Stoneleigh, Modus Operandi Brewing C, and many others. industries. They are a unique team of commercially minded designers and developers with the experience in delivering intelligently crafted digital solutions and strategies. A full-service digital branding agency in San Diego & Paris. Prokhorov Design – the experienced design team based between Moscow and Los Angeles. They love helping IT companies and startups from around the world to achieve their business goals by the design solutions. Their team works remotely, however, they understand that not everyone is ready to build trust relationship completely remote, so if it is possible they are able to come on site to your office for a kickoff meeting. They create and simplify brands, e-commerce, and digital products. They design and build beautiful digital products that make a difference. They are a handsome creative agency for the nimble and bold. They created a new experience for a vibrant coworking giant. From Bruce Lee to Marilyn Monroe, from The Lord of the Rings to James Bond, they are proud to offer, for sale or exhibition, a selection of articles from their exclusive collection of highly desirable movie costumes, props, and fine photographic art. karlssonwilker is a full-service design studio based in New York. They work with design-conscious clients on progressive solutions by providing them with a variety of services including the development of brand identities, signage and wayfinding, environmental design, packaging, animations, infographics, and website design, as well as strategy and concept direction. IconInc offers a 7-star luxury student accommodation in Leeds and Liverpool. With each pie devotedly handmade in Devon using only the finest, freshest ingredients, Tom’s Pies stand for honesty, quality, and artisan taste. Onirim is a creative Production company. They represent directors, photographers, and creatives. They produce commercials, brand content, and photos. Beaubourg is a digital-minded branding consultancy based in Paris. Revealing what makes brands unique and truly remarkable, they strive to define, establish and sustainably expand the presence. As an award-winning creative with over fifteen years in the industry, he specializes in creating immersive visual stories for a wide variety of brands. Page\Park is an award-winning architectural practice undertaking work across the UK from our studios in Glasgow and Leeds. They are an Employee Owned Business reflecting our culture of sharing ownership and responsibility across all that they do. 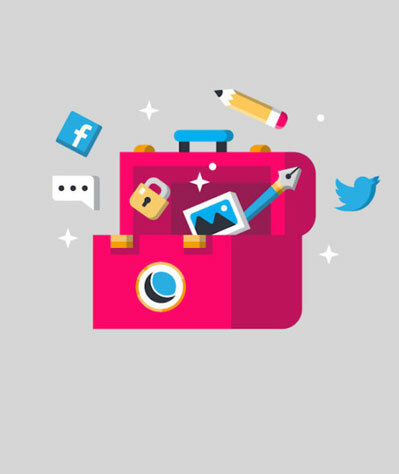 They are a digital creative agency in Sydney combining creativity and digital expertise to find the perfect way to engagingly tell your story. No fluff, no guff, no 404 errors. Portfolio websites are an amazing way of putting your work “out there” and building your brand. However, it is not enough just to build an amazing online portfolio – you also need to maintain it regularly. Don’t forget to keep your designer portfolio fresh with new content, follow the latest design trends and stay flexible about changing things, and don’t forget to update it with your current work. Keep in mind that the best online portfolio websites are not only those websites that are creative and different from the competitors, but also those that truly represent who you are as a creative professional.